In the impromptu talk on the vigil of Pentecost that became his "first encyclical" of sorts, the Pope was asked "How [he] arrived at the certainty of faith." "I had the great blessing of growing up in a family in which faith was lived in a simple, practical way. But above all, it was my grandmother who influenced my journey of faith. She was a woman who explained to us, who talked to us about Jesus, who taught us the Catechism. I always remember that on the evening of Good Friday she would take us to the candle-light procession, and at the end of this procession “the dead Christ” would arrive and our grandmother would make us — the children — kneel down and she would say to us: “Look, he is dead, but tomorrow he will rise”. This was how I received my first Christian proclamation, from this very woman, from my grandmother! This is really beautiful! The first proclamation at home, in the family! And this makes me think of the love of so many mothers and grandmothers in the transmission of faith. They are the ones who pass on the faith. This used to happen in the early Church too, for Saint Paul said to Timothy: “I am reminded of the faith of your mother and of your grandmother” (cf. 2 Tim 1:5). All the mothers and all the grandmothers who are here should think about this: passing on the faith! Because God sets beside us people who help us on our journey of faith. We do not find our faith in the abstract, no! It is always a person preaching who tells us who Jesus is, who communicates faith to us and gives us the first proclamation. And this is how I received my first experience of faith." Indeed, four months into his occupancy of Peter's chair, the 266th bishop of Rome is never more impassioned or moving than when he witnesses to his deepest spiritual root as the son of his Italian immigrant grandmother. 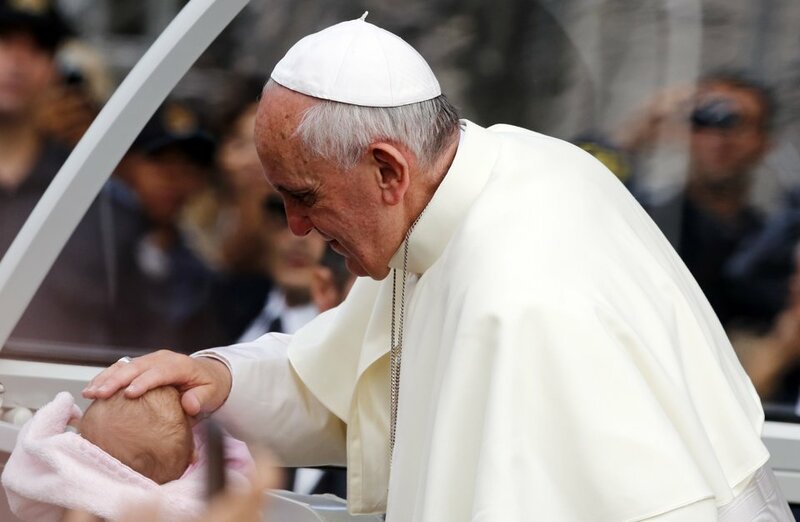 On this trip, that bond was most powerfully visible as Francis broke from what's become his invariable form, rushing past a group of priests in order to reach the image of Our Lady of Aparecida on Wednesday, then appearing overcome as he stood before it. 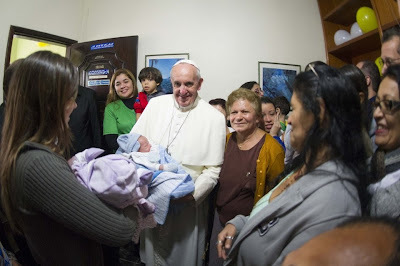 In its wake, the most authoritative Bergoglio-watcher of all – Elisabetta Piqué, the veteran Rome correspondent for Argentina's top daily La Nación – termed the moment "the most emotional" she's ever seen the now-Francis. Whether for a Pope or a pauper, though, that's no surprise: when this experience has formed, marked and defined one's life, it remains everything forever – and, to be sure, not even the papacy has a shot of changing that. I give thanks to Divine Providence for bringing me here to the city of São Sebastião do Rio de Janeiro. I offer heartfelt thanks to Archbishop Orani Tempesta and to each of you for your warm welcome, which demonstrates your affection for the Successor of Peter. I would be happy if my visit to this city were to renew, in each one of you, your love for Christ and his Church and your joy in being one with him, belonging to the Church and being committed to offering a living witness to the faith. The Angelus prayer is a beautiful popular expression of the faith. It is a simple prayer, recited at three specific times during the day. It thus punctuates the rhythm of our daily activities: in the morning, at midday, and at sunset. But it is an important prayer. I encourage each of you to recite it, along with the Hail Mary. It reminds us of a luminous event which transformed history: the Incarnation, the moment when the Son of God became man in Jesus of Nazareth. Today the Church celebrates the parents of the Virgin Mary, the grandparents of Jesus, Saints Joachim and Anne. In their home, Mary came into the world, accompanied by the extraordinary mystery of the Immaculate Conception. Mary grew up in the home of Joachim and Anne; she was surrounded by their love and faith: in their home she learned to listen to the Lord and to follow his will. Saints Joachim and Anne were part of a long chain of people who had transmitted their love for God, expressed in the warmth and love of family life, down to Mary, who received the Son of God in her womb and who gave him to the world, to us. How precious is the family as the privileged place for transmitting the faith! Speaking about family life, I would like to say one thing: today, as Brazil and the Church around the world celebrate this feast of Saints Joachim and Anne, Grandparents Day is also being celebrated. How important grandparents are for family life, for passing on the human and religious heritage which is so essential for each and every society! How important it is to have intergenerational exchanges and dialogue, especially within the context of the family. The Aparecida Document says, “Children and the elderly build the future of peoples: children because they lead history forward, the elderly because they transmit the experience and wisdom of their lives” (No. 447). This relationship and this dialogue between generations is a treasure to be preserved and strengthened! In this World Youth Day, young people wish to acknowledge and honour their grandparents. They salute them with great affection and they thank them for the ongoing witness of their wisdom. And now, in this Square, in all the surrounding streets, and in those homes that are experiencing this moment of prayer with us, we feel like one big family, and we turn to Mary, that she may protect our families and make them places of faith and love in which the presence of Jesus, her Son, is felt.